"All-in-one PDF solution for working with PDF files"
The PDF format has become the world standard for sharing information between multiple platforms. This is because it is an open standard, and applications from many different operating systems, including Windows, Linux and Mac OS, can read this kind of files. 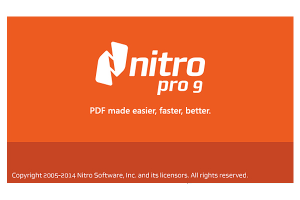 One of the best applications to handle PDF files is Nitro PDF Professional. This program lets your create, convert, combine, edit, share and digitally sign PDF documents easily. Nitro PDF Professional is a lot more than just a simple PDF reader. It allows you to quickly convert files from the Microsoft Office Suite, like DOC-files or PPT-presentations to the PDF format and vice versa, and you can do this in batch mode too. It also feature OCR (Optical Character Recognition) to extract text from scanned images. And it features security tools to digitally sign your documents, encrypt them with a 256-bit AES-key, and even remove the metadata, like the author's name, in this case your own.